After three more exciting races there is only one point separating Lars Johan Brodtkorb and Charlie Cumbley at the 2017 OK Dinghy European Championship in Faaborg, Denmark, after sharing the wins today in their group. The defending champion, Denmark’s Bo Petersen, is nine points behind. The other race wins went to Jan Kurfeld from Germany, Jens Lauge from Denmark and New Zealand’s Luke Gower. With the Danish summer now seemingly reduced to just one day, Wednesday, the fleet once again launched under falling rain and low clouds and endured nearly seven hours on the water in the wintry Danish conditions. The rain cleared after the first race of the day as the wind shifted from south to west, but it remained a generally bleak and grey day as three races tested the endurance and patience of the 130 OK Dinghy sailors. 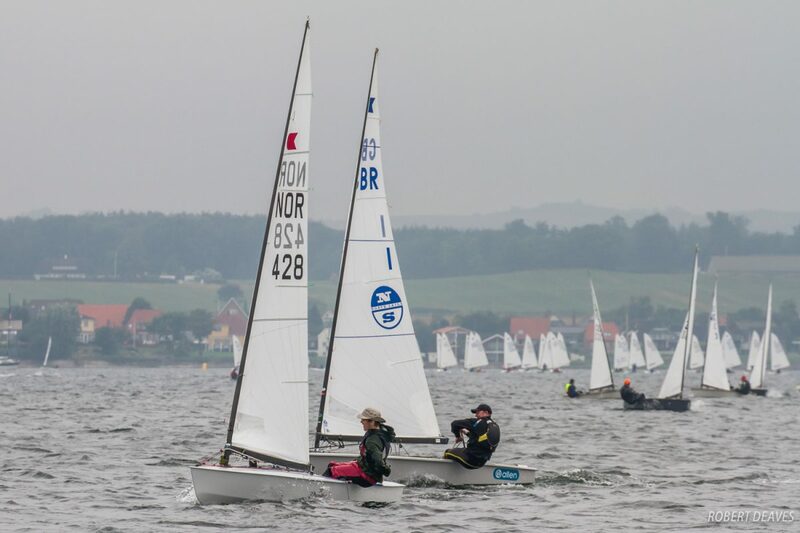 Highlights from Day 2 at the 2017 OK Dinghy Europeans in Faaborg, Denmark. Both Brodtkorb and Cumbley are in the same group, so are having a daily battle on the water. Thursday’s score was two wins to Cumbley and one to Brodtkorb, Cumbley having to chase down the Norwegian in the opening race to secure the win. Defending champion, Bo Petersen, is feeling a lot of local pressure to retain his title here, but a third in the opening race and a second in the last race has moved him up to third overall after several of the other contenders struggled today and picked up high scores. Jan Kurfeld, from Germany, won the opening race in his group before being pulled out of the second race while in the lead after picking up a second yellow flag for a Rule 42 infringement. The second race of the second group turned into a Danish benefit with Jens Lauge taking the win from long time leader Henrik Kofoed Larsen. The third best performer of the day was Gower, who sneaked a second place off Wilcox in the first race and then stormed the final race to win by several minutes, gaining hugely on the second upwind to hold a comfortable lead. Racing continues on Friday with three races scheduled as part of the 10 race series, which concludes on Saturday. After Friday’s races, the fleets will be split into gold and silver groups for the final two races on Saturday.